Drifting away from the usual weekend of hiking, trekking and climbing, our group decided to take a trip to Padre Burgos, Quezon. We would go to 3 beaches on the same day and camp wherever we may like. 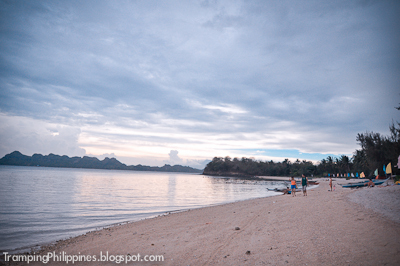 And because of the one-hour journey, we decided to make ‘puting buhangin’ beach our first destination. 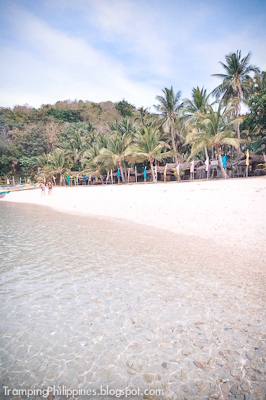 I was kind of surprised to see a white sand beach with crystal clear blue waters in Quezon. 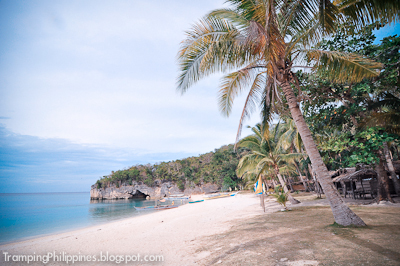 My expectations were low but it suddenly hit me after seeing the beach from afar. It was a hidden haven for guys like me such that I really have this thought of coming back to the place in the near future. 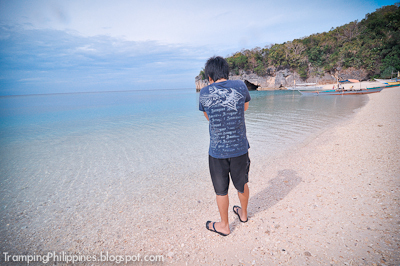 Aside from the caretaker, there was nobody there when our feet touched the sands at the seaside. 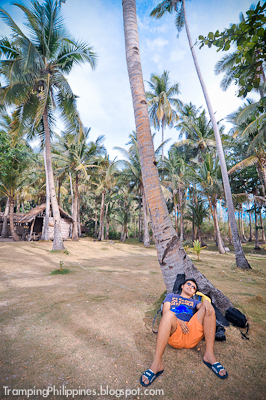 It was like having a private beach with the whole lot of camping grounds just for our group. 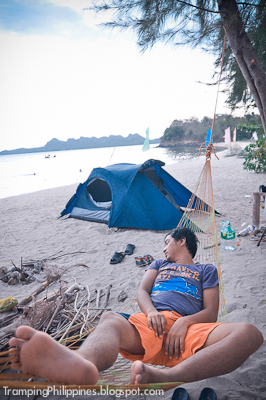 Nonetheless, we opted to camp either on Borawan or Dampalitan as they were much closer to the mainland. We stayed at ‘puting buhangin’ for about 2 hours. We spent most of the time swimming until we found a cave which connects to a cove opening to the main sea. Bryan, a true climber that he is, traversed the hill from the other side to the cove. The feeling of relief after lounging under the blue sky did not stay for long. Thick clouds began to hover over the place. It seemed inevitable that rain would pour so we decided to go to the other islands. Borawan was the island I was looking forward to but, sad to say, I was disappointed. For me it was not as captivating as the 2 other islands, so we thought pitching tents there would be a very bad idea. 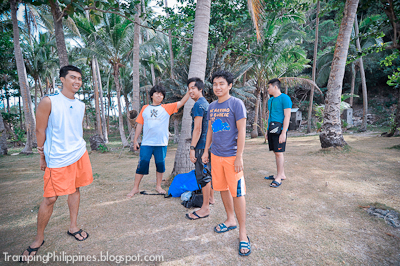 Finally, we decided to take dampalitan as our campsite. 20 minutes from Borawan is Dampalitan. There, we could see other groups pitched in their own grounds. We found a good spot and immediately unpacked. Bryan and Agnes gutted the fishes for cooking. Without much ado Ron and I started pitching the tents. It was a fun day. At sundown we prepared our dinner while our campfire started to grow. We traded stories, made fun of others who were not able to go. 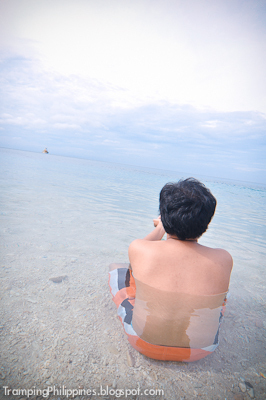 There were times when we just sat and stared at the beach, until we felt rain drops falling. Our gathering was cut short. We had to go inside our tents and sleep. The next day, still raining, we packed our things and went back to the mainland. Even on a simple beach camping, we had to endure the rain. Little did we know that the pouring will eventually turn to a Typhoon named 'Bebeng'. It's kind of a curse for our group that at some point in all our climbs and trips, no matter how good the weather is, the skies would turn for the worst and give us a downpour. But even though we were soaked and wet, it was still a good trip and an astonishing experience as well. It has been my slogan never to underestimate the mountains. Well, I have a new one. 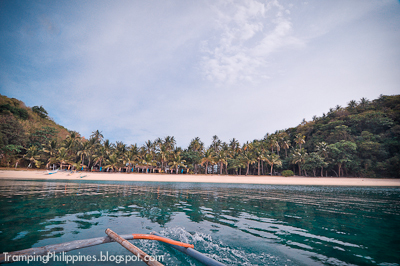 Never underestimate the beauty of the beach until you've been there because at one point, your ignorance may betray you and your low expectation may push you not to bring snorkels – and this you will regret for the rest of the trip. Take a Lucena-bound bus at Cubao or Buendia Bus Stations and get off at the Grand Terminal in Lucena. Then take a mini bus bound for Unisan and get off Vista Playa Restaurant. 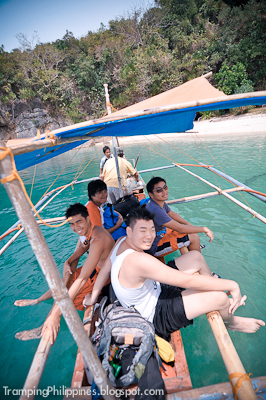 You can contact Kuya Uro at 0918-2550875 or you can just ask a boat at Vista Playa. Thanks for sharing... 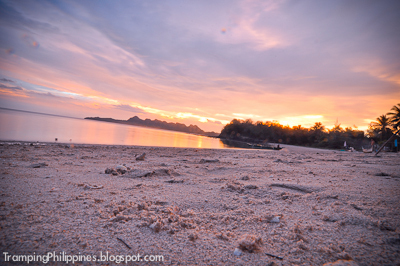 I'll add Quezon to my Lakbayan list! sir, magkanu po budget nyo dito per head? details po sna. 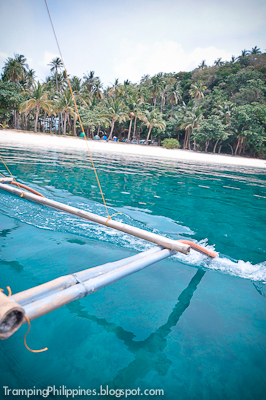 saka from vista playa po ba eh mhe boat nang mare-rent papuntang puting buhangin, borowan at dampalitan? boat fare rate po sana saka contact number.. i tried to call the number you provided kaso lang unattended e.
salamat po ng marami, sir! 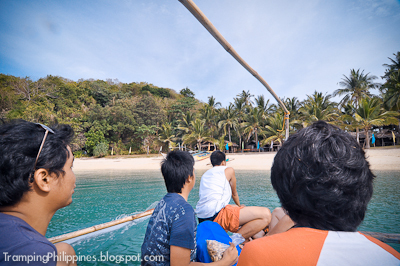 For a group of 6, approx 1400-1500 per person which includes the bus transpo, boat, entrance fee of the islands and food. 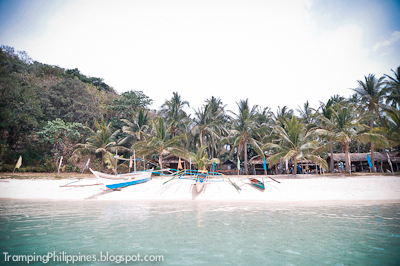 We rented a boat to get to dampalitan but we first went to Puting buhangin and Borawan. But if you'll just go to dampalitan, it is ok to trek from the main land. @bhastie.. You can do the boat arrangements at Vista Playa. 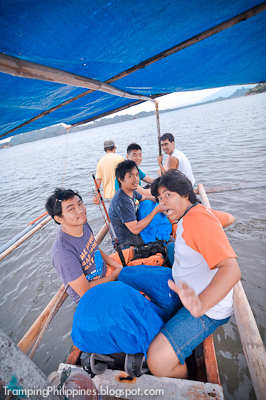 As i recall, the boat is approx 2000 or 2500 and this includes Puting Buhangin, Borawan and Dampalitan. I'll also try to get the latest number of Mang Uro. sir pa'join nmn s inyo..pede ba? Hi! 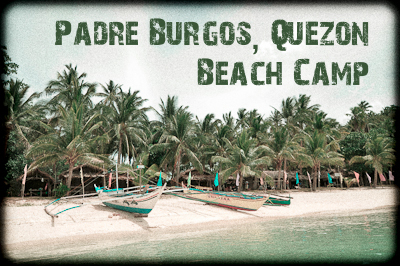 Me and my friends are planning to visit Padre Burgos this coming weekend. 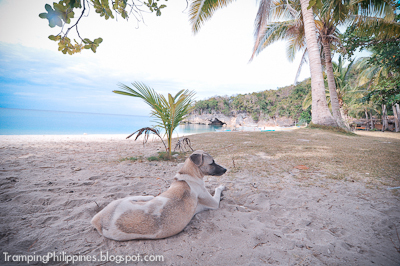 Glad I saw your blog and we might follow the Itinerary you wrote here. :)Just a few questions: 1)Can we cook our own food at Dampalitan? I've read from other blogs that cooking is not allowed in the island. 2)Do we need to inform the caretaker beforehand that we're planning to camp out? Thanks in advance! Yes. you can cook your own food at Dampalitan. 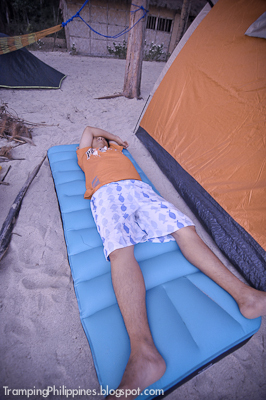 There is no need to inform the caretaker but it would be better if you'll arrive at dampalitan not to late to have a good spot for camping since it really gets crowded especially on peak seasons. We're glad that we've helped you on your upcoming trip. Thanks for the reply, Dane! :) Will keep that in mind. Do they have places where we can stay overnight? Maybe a resort? 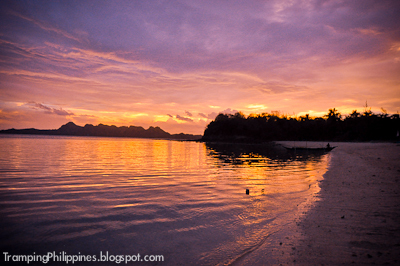 Hi, there are no resorts in Dampalitan as well as Borawan or Puting buhangin. You can just pitch tents if you want to stay there for the night. Let me just inform you that as for the latest we offer island hopping for 950/pax for 3 islands of borawan, damaplitan and puting buhangin. Hiring of boat ranges at around 1,800 to 2,200 only. 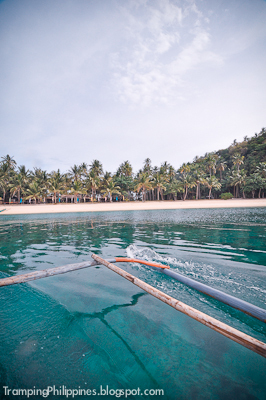 if you have inquiries or willing to arrange island hopping for 2 days and 1 night which is for only 950 or less for large group please feel free to contact me at 09178989750 or 09284484684. Thanks po. Im from Padre Burgos too. Wow! ang ganda naman dito, akalain mo meron gantiong kaganda dito sa Luzon? Ganda talaga. Sana makapunta rin kami dito kasama ng mga kaibigan ko pati family. Ererefer ko rin po ito sa friends ko salamat. hi. may i know if may bayad ang entrance jan and kung meron man.. how much po? thanks and god bless.. I can't remember exactly e. pero sa dampalitan ata if magcamp is 100 per person ata, dito kasi di ko maalala kung per person kami or per tent e. pero most likely ganun ung rate. dun naman sa puting buhangin (ung me maliit na kweba) dahil dumaan lang kami dun nagbayad ata kami ng less than 100 per person. I'm not sure if pag overnight dun kung how much.